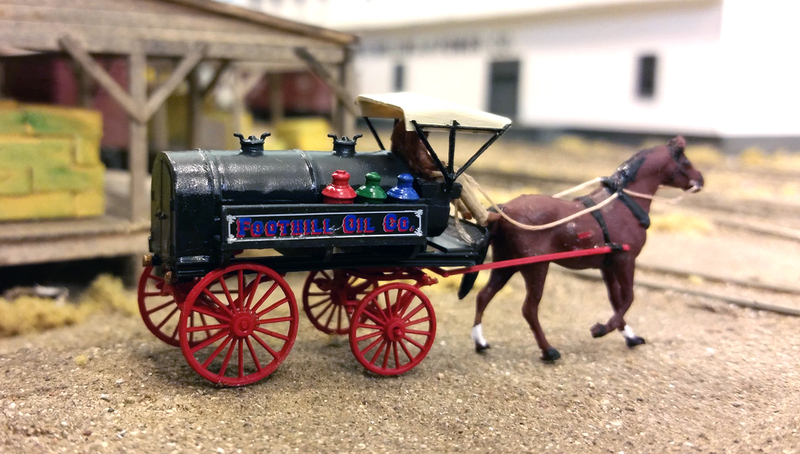 Custom decals were used on the wagon side. The cans on the side rack are from the Jordan Model AA tank truck. Once the kerosenes, oils, etc. had arrived at the distribution plant, they had to be conveyed to the customer. The innovative move at the time was the tank wagon. It would fill up with mostly kerosene plus some of the other products and then go door to door with the distributor's commercial customers who would take, in bulk, what they needed. If you did not need a whole barrel of a product, you could buy 10 or 20 gallons to suit your needs. 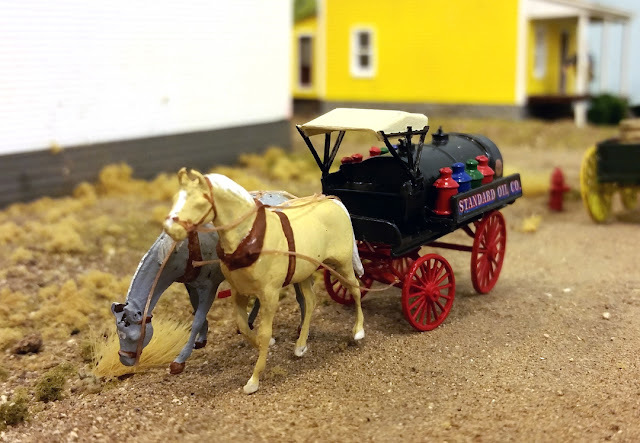 My model of a typical wagon was made from parts of several Jordan wagon kits. The tank came from their Model A Ford tank truck, the undercarriage is from a Standard Wagon Kit and the top is from the Buggy kit. The tank was assembled and glued to a couple of styrene channels. The front and rear wheel assemblies attached to this. A small block of plastic was attached to the front of the tank and shaped to form a seat rest. The seat itself was left over from another kit which I don't remember but it could be formed from some styrene. 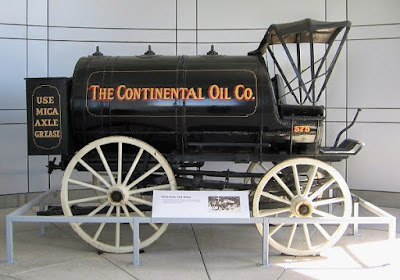 Standard Oil had fleets of these vehicles running through the streets distributing their product. The Foothill Oil wagon is used for the oil depot I built in Oakdale while the Standard Oil wagon will be used for a yet-to-be-built distributor in Stockton. The Foothill Oil Company is an independent firm buying its product from Standard, Union and Pacific Coast Oil companies. The north end of Oakdale has had a siding which served two industries, an oil distributor and a hay dealer. I never really liked how I had arranged the siding as it did not allow enough room for either industry. The situation finally nagged on me enough that I realigned the siding to give me some more room between it and the main line for some structures. 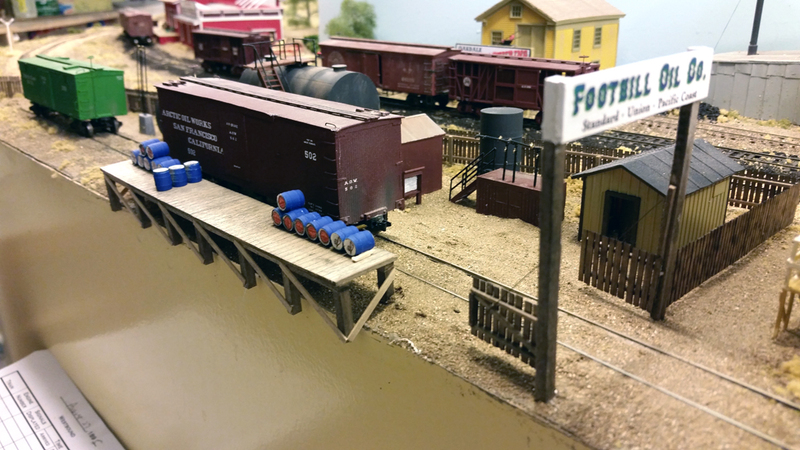 The Grandt Line Petroleum Distributor kit provided most of the tanks and structures needed. Note the Standard Oil blue barrel on the dock. At the end of the siding is the Foothill Oil Company. This is the third name change for this spot. At first, I thought it was a Continental Oil company site but later found out that Continental had been absorbed by Standard of Iowa in the 1880s. Some more research showed that a distributorship had not even shown up in Oakdale until early in the 20th century. For several years I had been switching cars there so I wasn't going to take it out so I created a fictional distributor. The tanks are a conglomeration of Grandt Line and Bar Mills tanks. I used a small office from an Atlas Lumber Yard and the pump house and distributing valves from the Grandt kit. The Grandt tank was cut down to a shorter version and the "concrete" supports cut down as well. The supports received a covering of styrene brick sheet to reflect an older construction period. 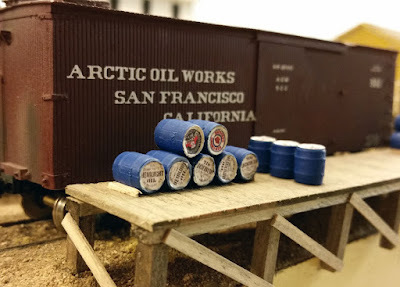 One of the things I did want to have, though, was the omnipresent blue barrels of the Standard Oil Company. Oil barrels are a specific size and most commercial barrels are too big or too small. I finally found a beer barrel in a Preiser kit which was about as close as I could get. I painted the barrels blue with the white tops of the prototype. Using the internet, I located images of old Standard Oil brands, reduced them to size and made decals for the top labels. Some of the labels came from black and white photos and had to be colorized slightly. While I didn't have room for a warehouse, I had almost enough room for the warehouse dock so I am making do with that. The dock itself overhangs the fascia somewhat but it gives a little credence that there is some more distributor in the aisle area. 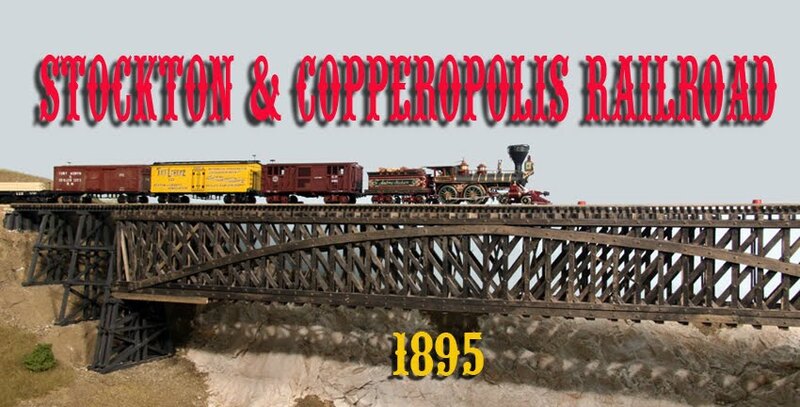 All I need now is a horse-drawn oil tank wagon to deliver bulk product to the Oakdale customers. That's up next on the project list. The A. L. Gilbert Company is a hay distributor and stores its product in the warehouse and in open-sided sheds. When horses were the main motie power, hay was a ubiquitous commodity. The animals had to be fed so growing and shipping hay was big business. 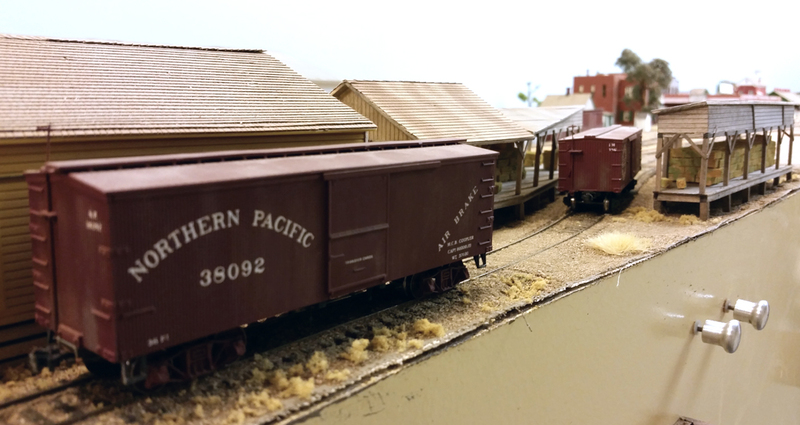 The A. L. Gilbert Company represents a local concern which purchases the hay from local farmers and then sends it by rail to its customers. Some time ago, I had built a small building for the Gilbert hay warehouse. Looking at it now makes it seems rather small. Hay was usually stored in open shed rather than inside so I decided to add a couple of these to the scene. The track arrangement forces both sheds to be oddly shaped but they were easily constructed of stripwood. The hay bales themselves were pieces of balsa strip stock cut to length. I stacked them up resemble hay warehouses I had seen and then colored them with yellow ochre paint streaked with green. I guess I'll need a couple of wagons now bringing hay to Gilbert's.